Six shocking nodes for guaranteed delivery of pain stimulus through one layer of clothing. Adjustable modes of shock available. Smooth, moisture resistant, easy to wipe surface for quick cleaning after use. Adjustable, webbed nylon belt for all body types and superior durability. The StressX add-on for the irVest provides even more realism to your training by creating a pain stimulus when the user is shot. 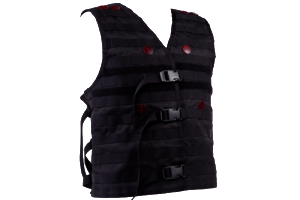 The StressX is a safe way to create stress-based training when using irTactical gear. Simply sync the StressX belt to the irVest, set your mode, and begin training. StressX is completely wireless and has a variety of modes ranging from vibration, mild, or strong shocks. They can be adjusted on the fly and customized depending on the role that the user is training as. The belt is extremely durable and is capable of delivering a shock through one layer of clothing. Trainees can strap it on and go. As an option, trainers can also pair the heart rate monitor belt with the StressX. This allows operators to see the physical stress elevation within the trainee’s body. The monitor works wirelessly with the StressX and requires no additional set up.